Lieberman says he will campaign for Republicans in 2010. (CNN) - Days after drawing anger from liberal Democrats for opposing a public option to the Senate health care bill, Sen. Joe Lieberman is adding fuel to the fire, telling an interviewer it's likely he'll campaign for some Republicans in next year's midterm elections. "I probably will support some Republican candidates for Congress or Senate in the election in 2010. I'm going to call them as I see them," Lieberman told ABC News in an interview published Friday. 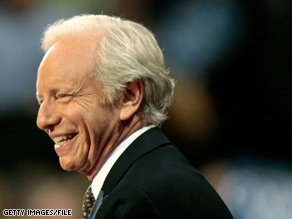 Supporting Republicans is nothing new for Lieberman of course: the Democrat-turned-independent senator from Connecticut was a constant fixture on campaign trail on behalf of Republican John McCain's presidential bid. He also supported Maine Sen. Susan Collins and New York Rep. Peter King last year over the Democratic Party candidates in those races. Senate Democrats had threatened to revoke Lieberman's powerful Homeland Security Committee chairmanship after the 2008, election but ultimately decided to let him retain the post. Lieberman, who lost a Democratic primary race in 2006 but ultimately won the general election as an independent candidate, also told ABC it is "an open question" whether he will again seek the Democratic nomination in 2012. It's amazing to see all of the liberals condemming a man for following his conscience. This man has character and ethics, I guess that's something that liberals can't understand. If Liberman were a Republican and pulled such antics they would have thrown him under the bus so far by now you wouldn't be able to find him. And I'm sure Rush, Sean, and Glenn would have been leading the charge. The Dems need to GROW A PAIR and dump this Judas ASAP. Time to take our country back!!! Say it ain't so, you pathetic sorry old man. If the people of Connecticut agree with his votes and continue to vote for him, I don't really see what difference it makes what party is he in. Why are people so afraid of democracy? Ind or not one thing for sure is dat hez not getin elected! @ G SMITH: Wow, how did you do that? Did you practice in a mirror for hours so you could say what you said without your head exploding? Neat trick. I am ashamed Joe Lieberman is a Senator. He is the most wishy-washy, war-mongering, in bed with lobbyists Senator ever. To think Liberman was Al Gore's running mate? Makes people wonder. Way to go Joe. It's too bad we don't have more politicians who think independently. It's even more distressing that the Democratic or Republican leadership would threaten to remove committee positions based on that leader speaking his mind. It's a sad day when we're left with one Senator who's willing to do what he thinks is right regardless of his party's beliefs.